Mr Blue, Miss Red and Mrs Green are people with different utility functions. Which of the statements about the 3 utility functions is NOT correct? (a) All rational people prefer more wealth to less. (b) Mr Blue is risk averse. (c) Miss Red is risk neutral. (d) Mrs Green is risk averse. (e) Mrs Green may enjoy gambling. (a) Mr Blue prefers more wealth to less. Mrs Green enjoys losing wealth. (b) Miss Red has the same utility no matter how much wealth she has. (c) Mr Blue is risk averse. (d) Miss Red is risk averse. (e) Mrs Green is risk loving. (a) Mr Blue and Miss Red prefer more wealth to less. (b) Mrs Green enjoys losing wealth. (d) Miss Red is risk neutral. (e) Mrs Green is risk averse. (a) Neither Miss Red nor Mrs Green would appear rational to an economist. (b) Mrs Green is satiated when she has $25 of wealth. That is her bliss point. (c) Mrs Green is risk loving when she has between zero and $25 of wealth, same as Mr Blue. (d) Mrs Green is risk averse when she has between $25 and $50 of wealth. (e) Mrs Green is risk loving when she has between $50 and $100 of wealth, same as Mr Blue. 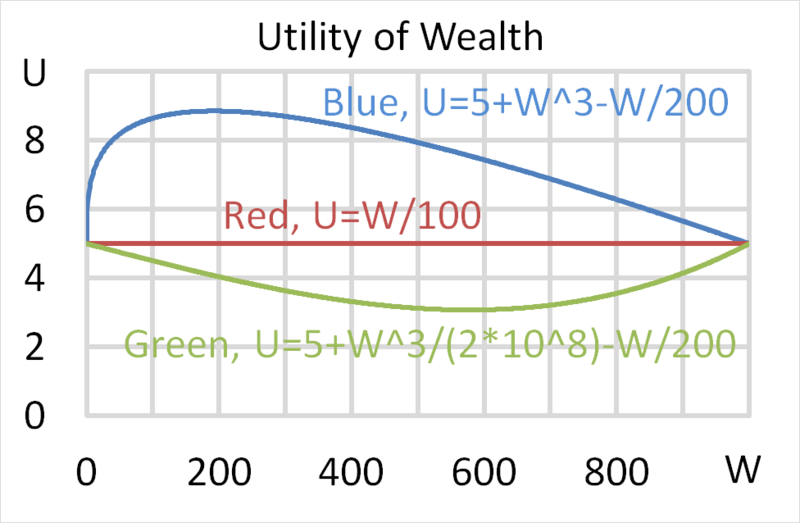 (a) Mr Blue's expected utility of wealth from gambling is 7.5 while refusing is 8.54. So the gamble makes him less happy. 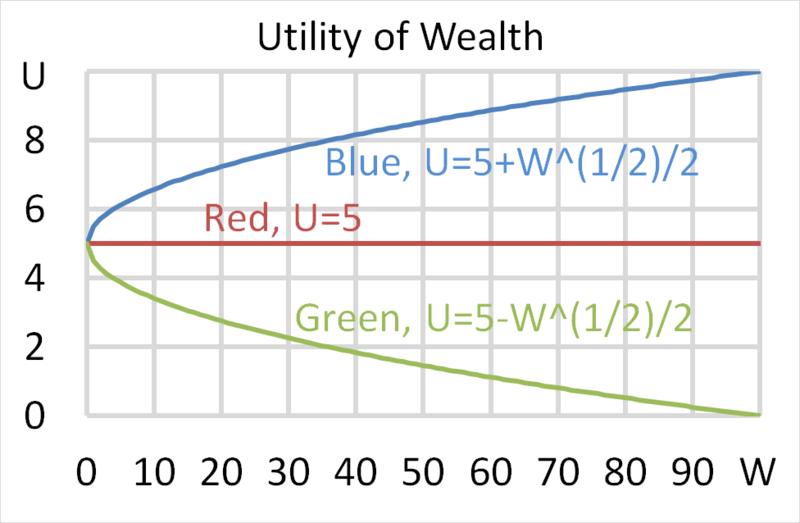 (b) Miss Red's expected utility of wealth from gambling is 5 and refusing is also 5. So the gamble doesn't affect her happiness at all. (c) Mr Blue's certainty equivalent of the risky gamble is $25. This is less than his current wealth which is why he would refuse. (d) Miss Red's certainty equivalent of the risky gamble is any wealth. She's indifferent since she always has the same level of happiness. (e) Mrs Green's certainty equivalent of the risky gamble is $25. This is less than her current wealth which is why she would refuse. 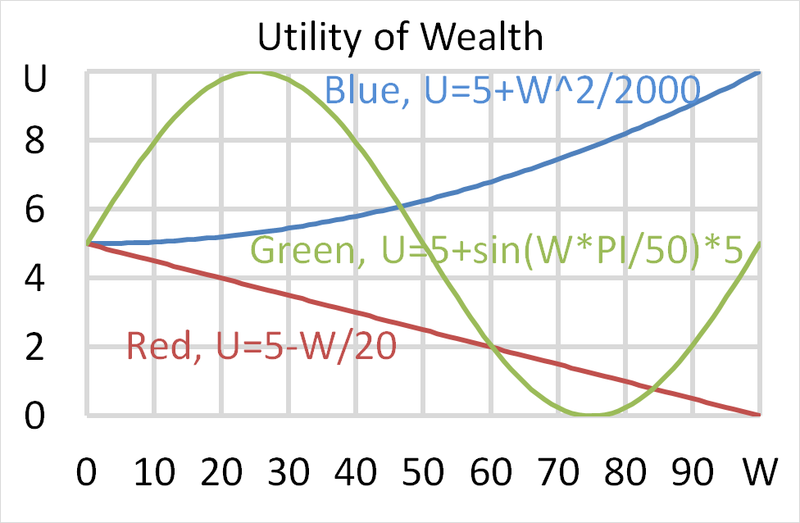 (a) Mr Blue's expected utility of wealth from gambling is 7.5 while refusing is 6.25. So the gamble makes him more happy. 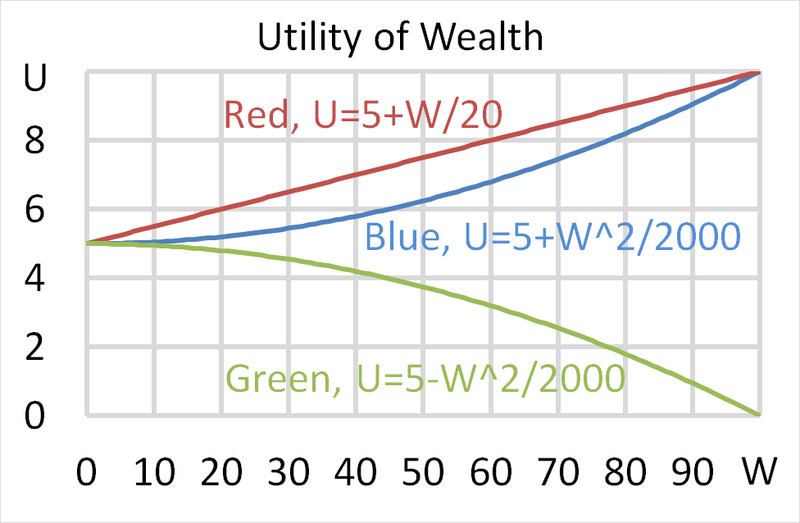 (b) Miss Red's expected utility of wealth from gambling is 7.5 and refusing is also 7.5. This is why she is indifferent. (c) Mr Blue's certainty equivalent of the risky gamble is $70.71. So he would pay to take part in the gamble. (d) Miss Red's certainty equivalent of the risky gamble is $50. (e) Mrs Green's certainty equivalent of the risky gamble is $70.71. She would enjoy taking part in the gamble. (a) Mr Blue would enjoy the gamble. (b) Miss Red would be indifferent to gambling or not. (c) Mrs Green would dislike the gamble. (d) Mr Blue's certainty equivalent of the risky gamble is $70.71. This is more than his current wealth which is why he would like to gamble. (e) Miss Red's certainty equivalent of the risky gamble is $50. This is the same as her current wealth which is why she is indifferent to gambling or not. Each person has $500 of initial wealth. A coin toss game is offered to each person at a casino where the player can win or lose $500. Each player can flip a coin and if they flip heads, they receive $500. If they flip tails then they will lose $500. Which of the following statements is NOT correct? (a) All people prefer more rather than less wealth which is rational. (b) Mr Blue is risk averse, Miss Red is risk neutral and Mrs Green is risk loving. (c) Mr Blue's certainty equivalent of the gamble is $225. This is less than his current $500 which is why he would dislike the gamble. (d) Miss Red's certainty equivalent of the gamble is $500. This is the same as her current $500 which is why she would be indifferent to gambling. (e) Mrs Green's certainty equivalent of the gamble is $793.70. This is more than her current $500 which is why she would like the gamble. Each person has $256 of initial wealth. A coin toss game is offered to each person at a casino where the player can win or lose $256. Each player can flip a coin and if they flip heads, they receive $256. If they flip tails then they will lose $256. Which of the following statements is NOT correct? (a) All people would appear rational to an economist since they prefer more wealth to less. (b) Mrs Green and Miss Red would appear unusual to an economist since they are not risk averse. (c) Mr Blue's certainty equivalent of the gamble is $64. This is less than his current wealth of $256 which is why he would refuse the gamble. (d) Miss Red's certainty equivalent of the gamble is $256. This is the same as her current wealth of $256 which is why she would be indifferent to playing or not. (e) Mrs Green's certainty equivalent of the gamble is $512. This is more than her current wealth of $256 which is why she would love to play. (a) Mr Blue is as happy with zero wealth as he is with $1,000. Similarly for Miss Red and Mrs Green. (b) All of the people would appear irrational to an economist. Though Mr Blue appears to be rational when he has more than $192 in wealth. (c) Mr Blue is risk averse. Miss Red is risk neutral. Mrs Green is risk loving. (d) Miss Red is totally indifferent to how much wealth she has. She doesn't care about gaining or losing money. (e) Mr Blue prefers more to less up to a wealth of around $192. At about $192 he is the happiest he can be. This is his bliss point. With more than $192 he becomes less happy. 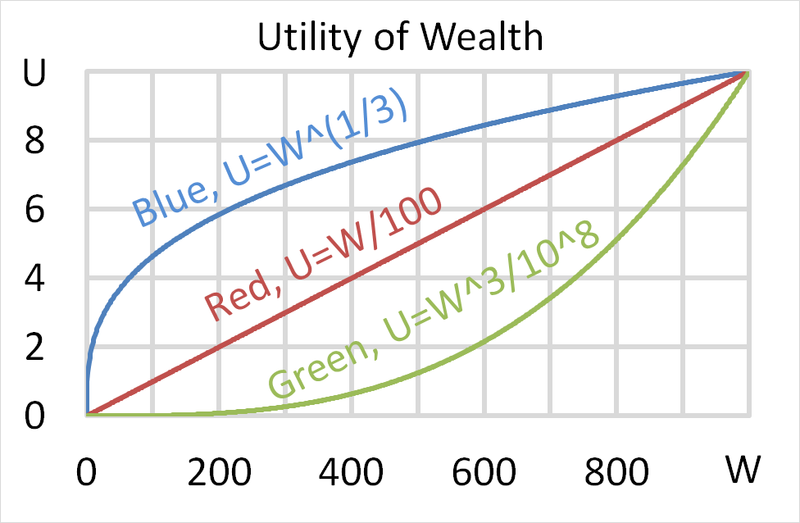 Below is a graph of 3 peoples’ utility functions, Mr Blue (U=W^(1/2) ), Miss Red (U=W/10) and Mrs Green (U=W^2/1000). Assume that each of them currently have $50 of wealth. Which of the following statements about them is NOT correct? (a) Mr Blue would prefer to invest his wealth in a well diversified portfolio of stocks rather than a single stock, assuming that all stocks had the same total risk and return. (b) Mrs Green would prefer to invest her wealth in a single stock rather than a well diversified portfolio of stocks, assuming that all stocks had the same total risk and return. (c) The popularity of insurance only makes sense if people are similar to Mr Blue. (d) CAPM theory only makes sense if people are similar to Miss Red. (e) The popularity of casino gambling and lottery tickets only make sense if people are similar to Mrs Green. Gross discrete returns in different states of the world are presented in the table below. A gross discrete return is defined as ##P_1/P_0##, where ##P_0## is the price now and ##P_1## is the expected price in the future. An investor can purchase only a single asset, A, B, C or D. Assume that a portfolio of assets is not possible. (a) A's Arithmetic Average Gross Discrete Return (AAGDR) is the highest. (b) B's Geometric Average Gross Discrete Return (GAGDR) is the lowest. (c) C's GAGDR is higher than its AAGDR. (d) D's AAGDR and GAGDR are equal since it's volatility is zero. 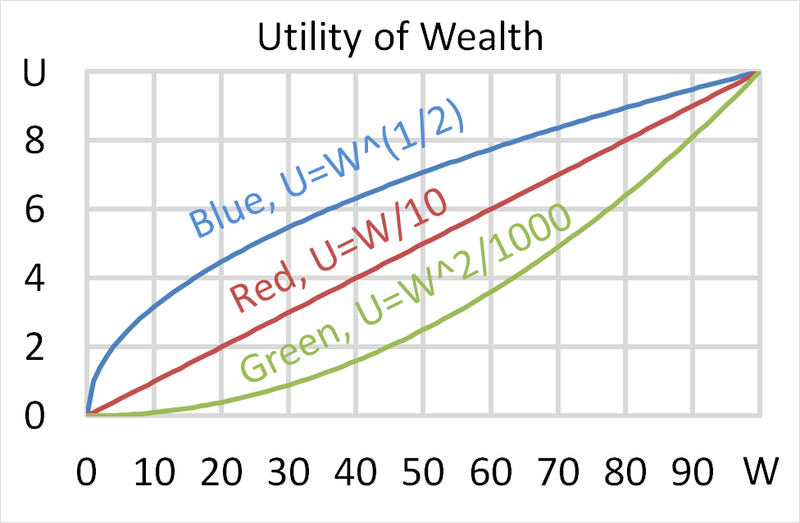 (e) C's expected utility of wealth would be the highest for an investor with a log utility function.